Four bands and more synths than even Ultravox used in their heyday greeted me once I paid the modest $5 cover at the door. 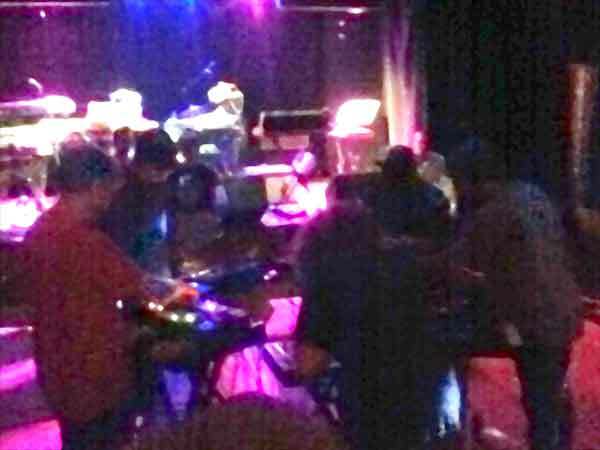 There was a hexagon of six keyboard racks taking up floor space in front of the stage with five synths and a rack fill of effect pedals. the stage is jam packed with keyboards of every stripe. 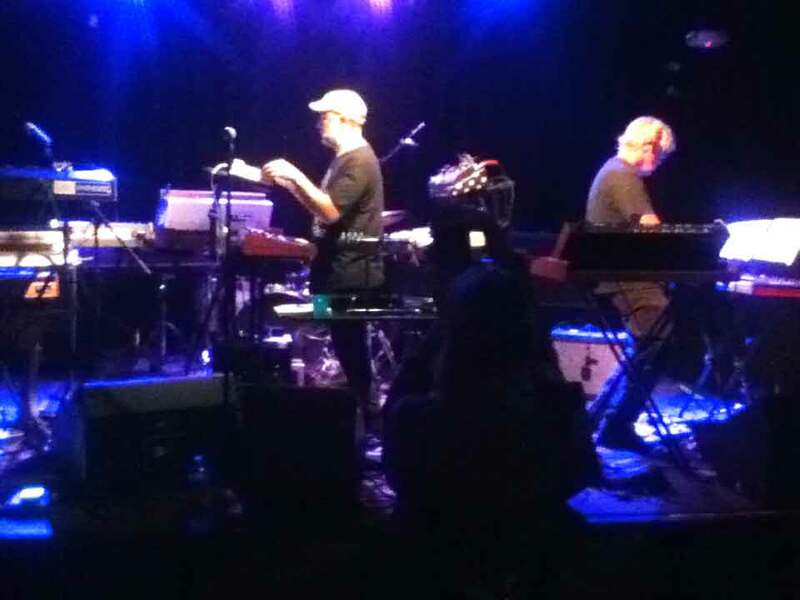 There was not a laptop to be seen on stage anywhere the night of this farewell to Asheville show from the all-analog Volt Per Octaves. The Volt Per Octaves are Anna and Nick Montoya; a pair of Moog Music employees [that Friday was their last day at work before moving out to parts unknown] who play together as a family unit with their daughter Eva also with them. The family that Moogs together vogues together, I guess. I first heard about them at the last Moogfest held here. I skipped seeing them because I thought that since they were a local act, I would have plenty of time to see them later, I reasoned [badly]. As it turned out, I caught them only once earlier, when they had an album release party two years ago at The Grey Eagle. Their special guest for that show was Bernie “Woo” Worrell sitting in with them. He was like a family member with them, since he’s a Moog Man through and through. Obviously, the show was great but I couldn’t buy their album [LP only, sigh] since when the show ended no one manned the march table during the ten minutes I waited before heading home to bed. I next tried to see them last year when they headlined a show at The Grey Eagle that was a tribute to Worrell following his then-recent death. Unfortunately, I sat through the two openers and was too tired to see the headliners I’d come for. Hopefully this night would be “third time lucky,” but I was unsure. I had gotten up at 4:00 am and had worked an almost eleven hour day to make up for one of the two days I took off last week [hence the guest-blogs from chasinvictoria]. Since I had used up my three weeks of PTO as of Friday the 26th, I needed to work long hours the three days of last week. Even worse, I was working a day on Saturday to make up for the second day I took off on my time sheet. Sitting through a bill of four bands on a “work night” might be some sort of endurance test, I fear. It was bad enough in the 90s when I had to put up with this sort of tomfoolery at The Sapphire Supper Club in Orlando. Of course, that was a case of the club owners also being the booking agents and a bare-faced attempt to sell the maximum amount of booze. Since I don’t drink, all it did was alienate me to sit through multiple openers, with at least one of them unannounced, typically. I’m thinking the story in this case was different. I’d bet that all four of the bands were all fellow Moog Music employees and this was a last hurrah amongst friends and co-workers before the Montoya family left for alternate pastures. By a quarter after nine five young men manned the hexagon eight feet in front of me and began playing a swirling, burbling mix of delight. As improvised, the set was heavy with tribal pulsations, at times skirting to the left hand of house rhythms. Nice, but the thought occurred to me about 20 minutes through it all. Was this the synth equivalent of a jam band?? They did all have facial hair. A chap sitting the front of me played shaker percussion for it all. Then after 30 minutes they landed the mothership. 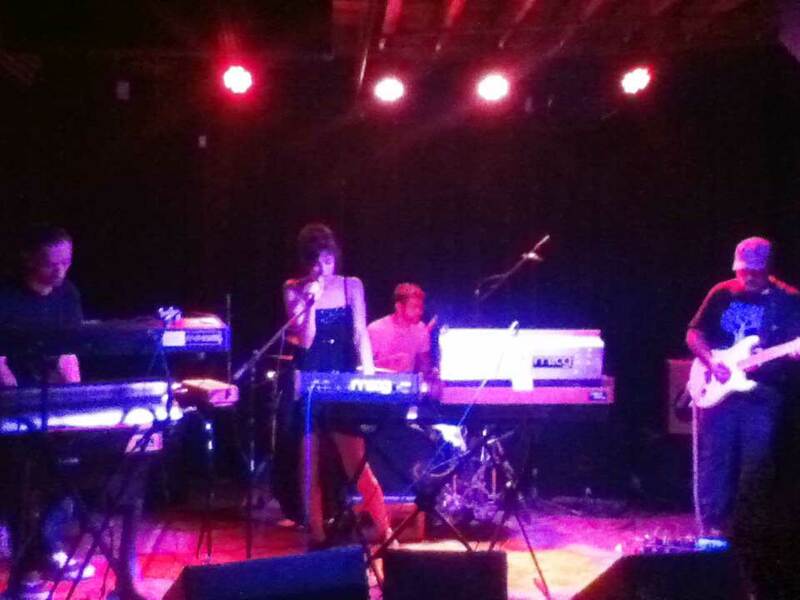 I just wonder what band they were on the bill since local Asheville bands are loathe to ever speak to the audience. Is it like that where you are? I don’t think it was Luxury Club, since they were a modular duo who opened the last time I tried to see the Volt Per Octaves. At ten, the second band began playing. They were a synth duo with no rhythm component with one member resembling our own Echorich. Their set consisted of instrumental songs with hints of OMD b-sides at their most abstract. Their third song had an actual beat highly reminiscent of the famous “Vienna” beat. Kind of nice. I thought “I should talk to these guys.” When it ended, I seriously needed to chat with these guys! I hope they were on Bandcamp… And what was their name!!? I tried to talk to one of them but he was talking with his buds who were yammering on and I have up. His cohort was getting ready to play guitar in the next band on stage. By 10:45 The VPOs were on. This time their daughter Eva was AWOL and I suspected she was away at college somewhere by this time. 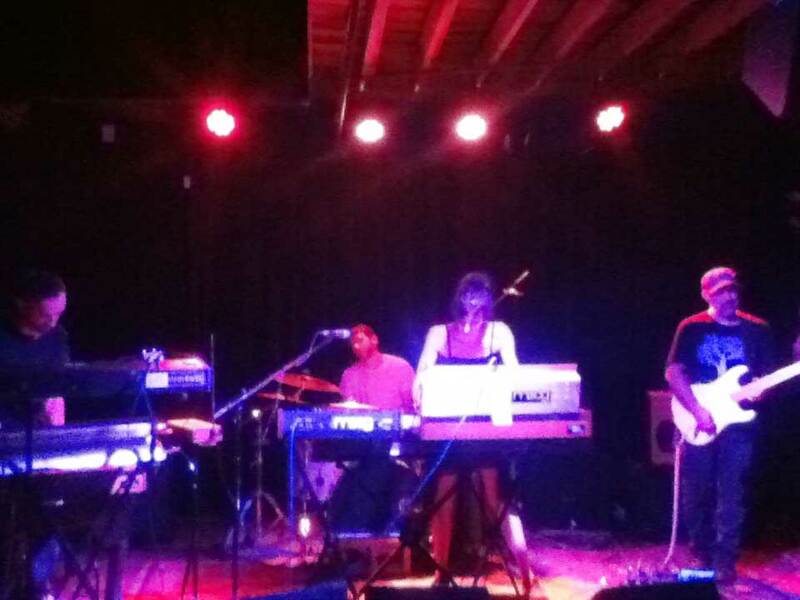 VPOs had a real, live drummer for a thick, powerful sound; all analog synths and drums. They dedicated a portion of their set to Bernie Worrell and played a mini-set of Bernie numbers like “Burning Down The House” with the gent from the second band now on stage playing guitar, stage left. They continued with several P-Funk classics like “Aqua Boogie.” Nick was also playing Theremin on some numbers and he brought out a talk box on their last number! I would have loved to have seen this band more than once a year and I’ll miss them. Thankfully, Nick Montoya thanked the support bands so now I knew that Cyboman played first, followed by Orgatroid! Now I knew who to look for on Bandcamp! I pray that I can purchase their final number as it was a glorious blend of Harold Budd ca. “The White Arcades” and OMD b-sides ca. “Dazzle Ships.” Yes, it was that wonderful! By 11:30 they broke down their gear leaving Luxury Club to close the place down. The last time I’d seen these guys they were modular duo who improvised a nice set. One of the gents from Cyboman was back on stage now with a guitar. There was also a second guitar player! This was going to be a very different band two years hence. Especially when the bassist took to the stage. Now the only synth was a single Moog that provided loop textures to their sound. 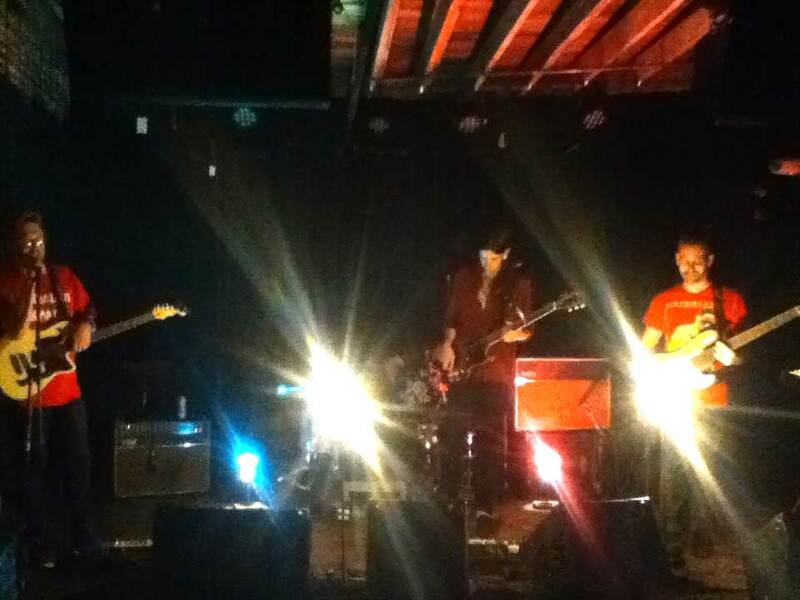 By midnight, they began their set with a pair of incandescent bulbs on stalks with rheostats lighting the stage warmly. The synth gave a pulse to synch with the drums while the three guitars wove a web of sound. Rhythmically it was complex and percussive but the guitars sounded sweet and harmonious, sort of like Allman Brothers gone Krautrock. The gent who was half of Orbitroid who had played with every band this evening was once again playing shakers. Around 12:30 I got the sense that this band were playing the longest set, and since I had to rise at 5:00 a.m.to work the next day, I took my leave having gotten quite a variety of fine sounds for my $5.00 cover. I was not dead on my feet, but I was determined to get more than four hours of sleep before a day’s work. I’m going to miss Volt Per Octaves. They were the sort of band that I fervently wished had been in my town in the 90s when garage rock [fun though it was] was about the best that Orlando had to offer me. The VPOs were on the funky side of the line but there’s nothing wrong that I can see with that. I suspect their now grown daughter might have flown the nest to college elsewhere and the family were moving on after having been here for several years working for Moog Music. Fortunately, with Orgatroid, I think I have another band to pay closer attention to, if I can stay on top of their comings and goings. If you don’t do social media, like myself, this is very difficult in the 21st century, but their sound was so Monsatic, I’d be an idiot to miss further opportunities to see and hear them develop further. This entry was posted in Concert Review and tagged 2017, Concert Review, Cyboman, Luxury Club, Orgatroid, P-Funk, Volt Per Octaves. Bookmark the permalink. SimonH – In all candor, anything past 9:00 pm is a late night for me. I’m an ” early to bed, early to rise” guy. Workdays begin at 4:00 am to get to the gym by 5:30-6:00. Last night was a long one. I stayed later at work and ate dinner there before heading to a house concert about halfway between the considerable distance between my work and home. David Torn was playing guitar and it didn’t start until sometime after eight; early for this sort of thing, but by intermission I was fighting sleep.